At a high-level meeting of senior Chinese Communist Party officials held in Beijing, Chinese leader Xi Jinping gave an opening speech on Jan. 21 that hinted at the severity of China’s economic downturn. “Improve the ability to prevent and control risks,” and “maintain healthy economic development and overall social stability,” Xi instructed the cadres. “Social stability” is an oft-used euphemism for the Chinese authorities’ agenda to quash protests that threaten the Party’s rule. Public protests have erupted over the past year due to economic woes that range from slumping real estate prices to collapsed peer-to-peer lending platforms. All top officials at the provincial and ministerial levels, in addition to members of the Party’s highest decision-making body, the Politburo Standing Committee, have convened for the Jan. 21–24 meetings, according to state-run media Xinhua. A “black swan” event refers to an unforeseen occurrence that typically has extreme consequences, while a “gray rhino” is a highly obvious yet ignored threat. A sense of urgency was conveyed in Xi’s speech, in which he emphasized that it’s all cadres’ “political obligation” to take measures to prevent economic risks. He also hinted that his sweeping anti-corruption campaign—initiated in 2012 when he came to power—would continue relentlessly. The campaign had achieved results, he said, “but the fight against corruption has not achieved complete victory yet,” Xi said, according to Xinhua. Chinese experts share Xi’s anxiety about the current state of the economy. On Jan. 20, Xiang Songzuo, a well-known economist, gave a speech at a Shanghai finance summit, analyzing the reasons for China’s economic downturn in 2018. According to Xiang, China’s capital market fell by 30 percent last year and the market value shrank by more than 7 trillion yuan (roughly $1 trillion). Looking at the past decade as a whole, China’s stock market decline has been comparable to the economic depression in the United States in 1929. Xiang pointed to Chinese companies that acquired mounting debt as they sought to expand. “These expansions are not driven by technology, growth incentives, profits, or private capital, but by relying on banks to lend them money, by issuing bonds, by relying on shadow banking,” he said. He once met the chairman of a major bank in Jiangsu Province, who told him that the coastal province—which is one of China’s largest regional economies—only has a handful of companies with profits over 1 billion yuan. In addition to the trade war—a “black swan” situation—the Chinese regime also has badly hurt the private sector’s confidence with increased state interference this past year. Chinese authorities took up several measures in 2018 that sent jitters in the private sector, including arresting and sentencing corporate executives, encouraging state-owned firms to buy assets in private companies, and other discriminatory policies. In September last year, netizens were abuzz after an online article from a self-identified financial expert, which called for the private sector to step aside after fulfilling its “mission” to help state-owned firms. Xiang said it would be difficult to restore private sector confidence to its original state. As for the “gray rhino,” Xiang called China’s overheated real estate market a real threat, as 80 percent of Chinese citizens’ assets are placed into such investments. He ended his speech by predicting that China’s debt problem will soon balloon to such a state that a “Minsky moment” will occur—an economic phenomenon in which a debt bubble collapses due to falling asset and property prices. Reuters and Annie Wu contributed to this report. 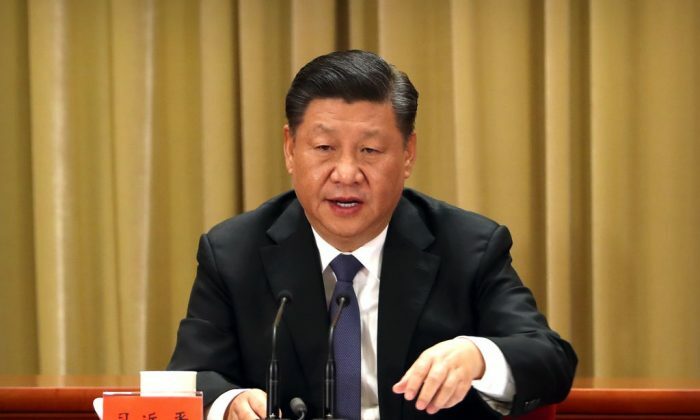 Chinese leader Xi Jinping held a meeting of the Politburo, where top Chinese Communist Party (CCP) officials discussed the regime’s biggest challenges.